Angelenos can now report improperly parked scooters (or other dockless vehicles like e-bikes) that are improperly parked to MyLA311 – LA’s one-stop-shop for requesting City services! Phone 3-1-1 from any landline or mobile phone in the LA area (if calling from outside the City, dial (213) 473-3231 or call (213) 473-5990 for TDD. Phone hours are 8 am – 4:45 pm daily. Tell the customer service representative that you’d like to report an abandoned or badly parked dockless vehicle. 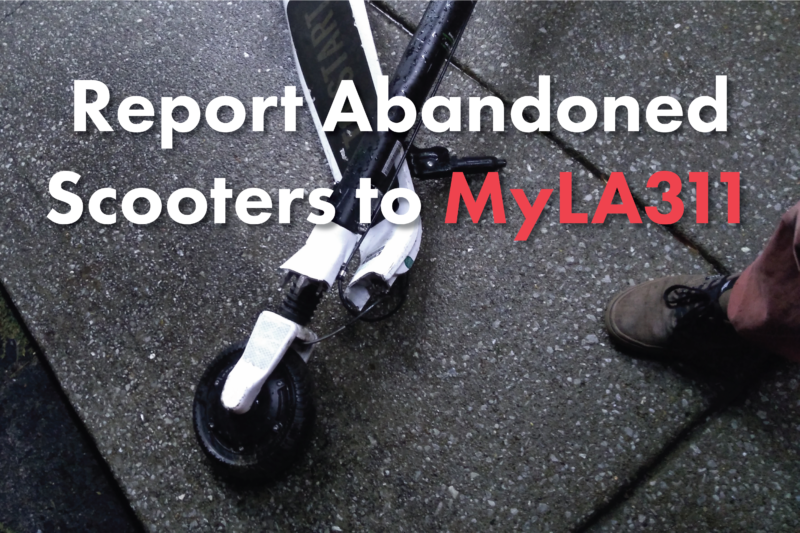 Visit the MyLA311 website at https://www.lacity.org/myla311-service-request; click the link to the Service Request Form; then select “Dockless Mobility Enforcement” in the Transportation section of the MyLA311 service request list. Use the MyLA311 mobile app for Android or iOS and select “Dockless Mobility Enforcement” in the Transportation section of the service request list. The app is available on the Google Play store, the Apple App store, and on the 311 website linked above.